Are you trying to find the best heat press machine 2019 has to offer? A hot press machine is a necessary investment if you wish to produce professional quality graphic designed products. Whether you wish to have a machine for hobby use or if you want a best heat press machine for small business; you need a machine that will allow you complete your projects in minimal time. Find below the top 10 best heat press machine review guide or simply grab the best options by clicking on the links below. 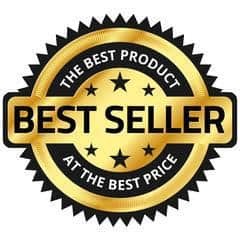 We also recommend you visit Amazon’s ‘Best Selling Heat Press’ List to see which machines are currently selling really well – it’s updated hourly based on real buyer reviews and ratings. Why Should You Invest In a Heat Press Machine For T-shirt Printing? 1. What is the best brand of heat press machine? 2. What does heat transfer mean? Below is a comparison chart of the top 10 heat press machines, which are mentioned in this article. 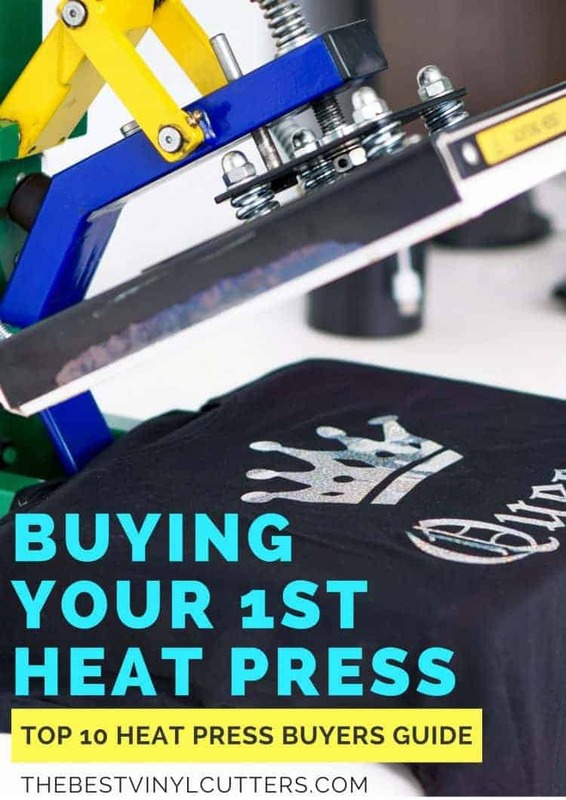 You can then read my heat press reviews below featuring the best heat presses 2019 has to offer. Whilst it might be easy to know that you need a heat press machine, it might be more challenging to try and figure which type of machine would suit you best! So before we hop into the heat press machine reviews, it really is important to understand the difference between the different types of machines on the market. So what is the difference and do you need a machine that can handle sublimation? 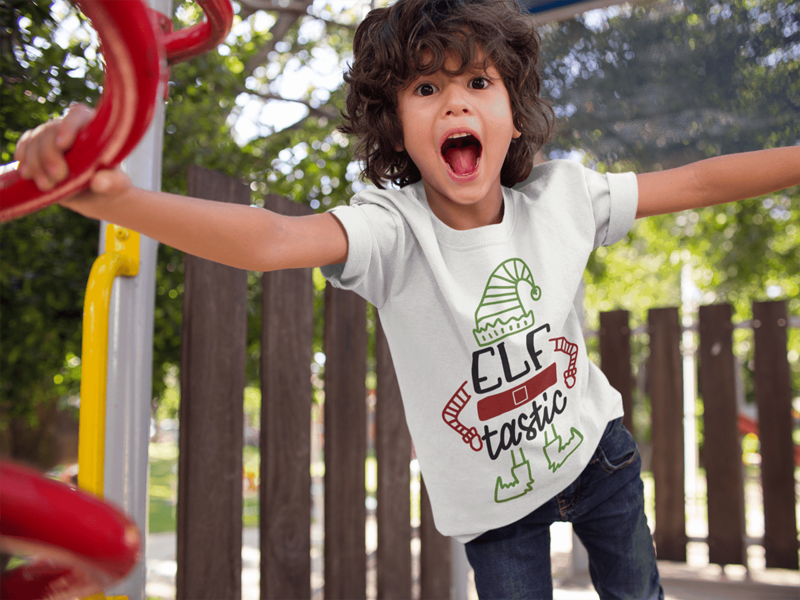 Heat Transfer is essentially the process of printing onto heat transfer paper. You will then need to heat press this transfer onto your product. Sublimation on the other hand is ink based and when heated it turns into a gas that will actually embed itself into special products that have a polyester coating. If you only wish to work with garment transfers, then you can save some money by purchasing a straight forward heat press machine. If however you wish to work with hard surface items such as mugs, tiles or license plates, the you will need to invest in a heat press machine that offers sublimation. The best starter heat press and the best heat press machine for home use is most definitely the very popular Fancierstudio Power Heat Press. It is our best selling machine. This machine has been designed as a hobby machine and is super easy to use. The clamshell design simplifies the pressing process and the electronic time and heat control which allows for precise time set-up. The machine is a brilliant machine and comes at a great budget price! It is the best t shirt heat press for home use and the best home heat press for vinyl! See the best vinyl cutting machine for your heat press here. If you are a beginner, you will love this machine! 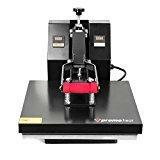 Read more in depth Power Press Heat Press reviews at the bottom of the page. Different types of heat press machines serve different purposes. If you are a beginner and you wish to work with flat transfers such as T Shirt Transfers, then we recommend the clamshell models. It is time efficient and the garment layout does not require as much attention to detail. These machines are also typically cheaper than the swing-away or multipurpose models. If you wish to step up the game and work with t-shirts with rhinestones, numbers and letters or sublimation printing; then I highly recommend you investigate the Swing-Away models more closely. These types of jobs require precision and you need a complete view of the layout area. It is important to have a think about what your purpose is with the machine! ​What size do you require? You can also find smaller heat presses for cheaper if you don't require a larger size. 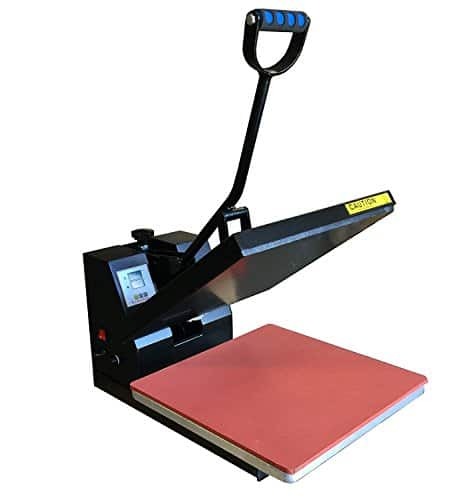 If you can work out your purpose and the size you require, it will be much easier when it comes to selecting the right heat press for your needs. If you are after a T shirt heat press machine​ our recommendation is to choose between either the 14 x 16" or the 16" x 20" models. Large format presses range from 20 x 25" upwards. For most of us, a manual operated heat press is all that is needed for our pressing needs. These machines are perfect for those who create sporadically or on a small batch basis. They are cheaper than automatic heat press machines and therefore a smarter investment if you are not planning on operating a large scale heat press business (and pressing for more than 4 hours a day). If you are sticking to only one heat press product, then we highly recommend you invest in a single application model. However if you know that you will be working a wide variety of products and materials you will need to purchase a model that has many interchangeable heat platens and bottom tables. Get﻿ the best quality heat press that you can afford. Investigate the feedback about the heat platen. Does it distribute heat evenly? Ensure that the model has a digital timer. 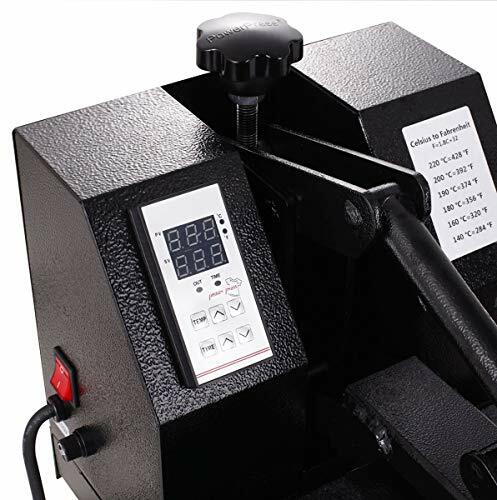 If you are purchasing a clamshell press, ensure that there is an adjustable force and pressure knobs so you can apply the correct amount of pressure to your garment. 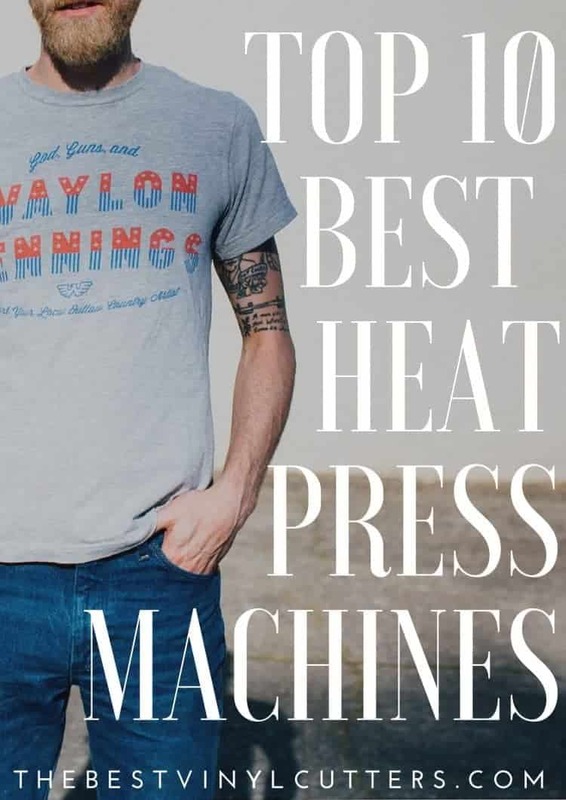 Find our top 10 heat presses and their reviews below. Below you will find the best heat press machines. We will have a close look at the top 10 heat press reviews. I will outline the top features, the pros and cons of each, as well as give you an indication of the average heat press machine price in detailed heat press machine reviews. We have only included the best heat press brands in our post, so whilst you might find cheaper machines, we highly recommend that you stay clear of them. 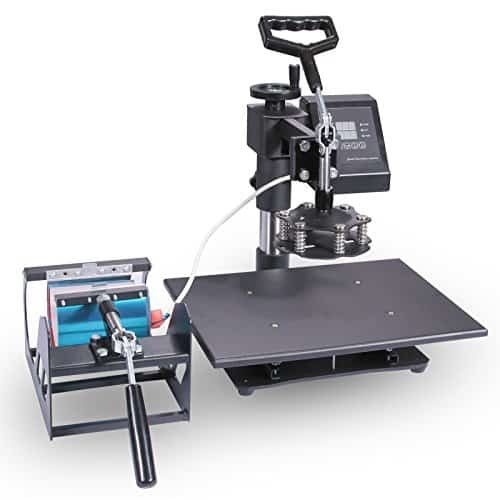 The FancierStudio Heat Press is one of the most in-demand heat presses for those who are specifically after an easy-to-use shirt press machine. This top selling 15x15 heat press is a digital heat press machine that operates as a clamshell types machine. It is compact and relatively lightweight. We love that the Power Press Industrial Heat Press has a handy Electronic time and Heat control which allows for precise time set-up. It is also our choice as the best t shirt press. The 1800-watt element, of the Power Heat Press 15x 15" Machine, can heat up to 500 degrees Fahrenheit and distribute the heat quickly and evenly. We have found that the silicone gel baseboard is perfect to generate the desired pressure for transfers, whilst the pressure adjustable system allows you to tweak the pressure needed for materials of various thicknesses. The Power Press machine is the best starter heat press, but it is also brilliant for those operating a small heat press business. It is versatile in its ability to transfer images on t-shirts, ceramic tiles, jigsaw puzzles, garments and bags. 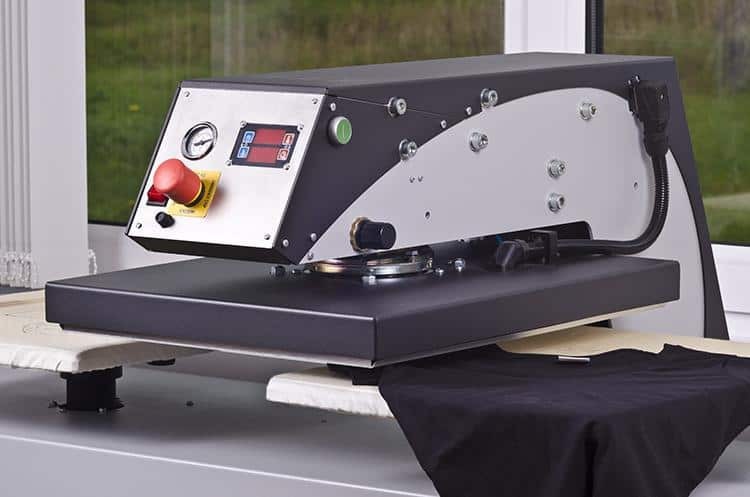 It is a standalone machine and the best heat press for t shirts and vinyl; so if you wish to work with items such as mugs, caps and thicker materials, we do suggest you have a look at our multipurpose machines instead. You can read our full review of this heat press here. The Fancierstudio Industrial Quality Digital 15 by 15 Inch machine is the best heat press machine for vinyl and T shirts designs. It is a best selling heat press transfer machine on Amazon due to the fact that it offers top notch quality for incredible value. This particular model is highly reliable and will offer you the industrial build that you can trust will last you for many years to come. You can easily find this machine for well under $300, however it is best to check the actual Power Press machine price on Amazon by clicking here. If you can find this top rated heat press machine in stock, we suggest you snap it up ASAP. 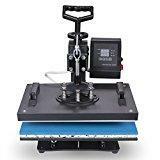 The Power Press Heat Press is a best selling machine on Amazon. You can easily browse through over 1000 reviews on this machine, most of which are very happy customers. This very popular 15x15" heat press is a digital heat press that operates as a clamshell type machine. It has an LCD screen where you can set your temperature and timing digitally. It is a truly versatile, reliable and amazingly affordable machine. The PowerPress is a fabulous machine for those who have an interest in working with t-shirts, sweatpants, canvas bags, to puzzles and so much more! The PowerPress a fabulous temperature range of 0 - 450 F and timer settings from 0 - 999 sec. We love the individual safety control chip, one of the very few heat press machines that we see with this feature. Of course it has a Teflon coated heat plate which is fabulous for those of us who work with vinyl. Heat is dispersed evenly. One small negative is that the machine is manual operated (all machines at this price-point are). But if you are doing a few jobs the manual labor can get a bit tiring. The PowerPress Industrial-Quality Digital 15-by-15-Inch is the best heat press for T-Shirt designs. Whilst we highly recommend this press for home-users, we know of a few small business owners that use the PowerPress and who are very happy with its performance. The machine offers you versatility, and reliability, all for an incredibly affordable price. This machine is selling like hot cakes and you will almost always find it in one of the first spots on Amazon's best selling heat press list. You can read through over a thousand reviews of current customers by clicking here. The F2C Pro 5 in 1 Heat Press Machine is a great machine for those who want to purchase a machine at the mid-way point between a hobby and professional machine. The F2C Pro 5 in 1 Digital Transfer Sublimation Heat Press allows you to print your attractive designs on different surfaces. It is specially made to print on assorted surfaces like mouse pads, tiles, puzzles, Ceramic plates, Mugs, Coasters and T- shirts respectively. We love how easy and reliable the digital time and temperature control of the heat press is. This is a very solid machine that has been built from steel frames to allow for heavy duty use. To learn more about this press, why not hop over to our full review post. 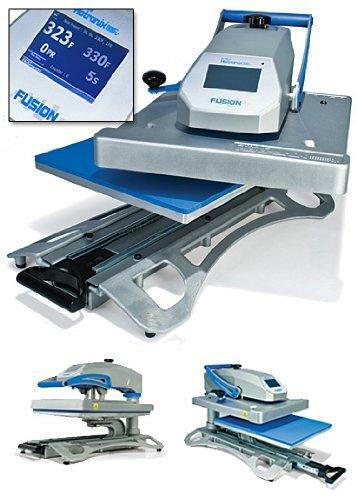 The F2C Pro 5 in 1 Heat Press Machine is a great multipurpose machine. It is sturdier and stronger than the other 5 in 1 machines on our list, but it also comes at a higher price tag. If you can reach the price, we would recommend this machine above the other multipurpose machines. 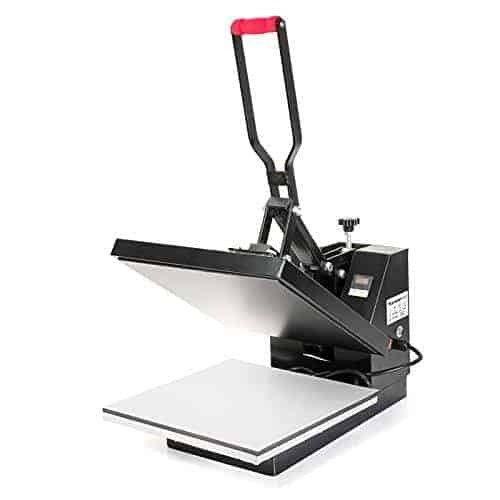 The DG 15x15" Clam Shell heat press is very similar to the Power Press and Gecko machines! It is a very popular heat press for vinyl designs; especially when it comes to shirts. In our opinion, this machine is a great machine for those who wish to use it on a hobby or sporadic basis. However if you are operating a small business, we suggest you invest in one of the Hotronix machines. 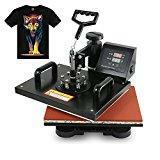 We love the bargain price tag of this great T shirt heat press machine; you can easily pick it up for under $200. We are also glad to see that there is a digital time and temperature display for accurate and precise timing, a teflon coated heat platen, as well as a great silicon rubber base (which you can adjust and move around). Clam Shell machines are great if you are limited in space and need a machine that is portable. This specific model is great for applying transfers, letters, numbers, and images on t-shirts, garments, bags, mouse mats, jigsaw puzzles, ID bags, ceramic tiles, as well as a range of other items. The DG 15x15" ﻿﻿H﻿eat ﻿P﻿ress ﻿V﻿inyl ﻿M﻿achine is a top seller when it comes to machines that are affordable and durable. This machine makes applying vinyl to shirts a breeze. Those who are starting out with heat pressing with truly love and enjoy this easy-to-setup and easy-to-use machine. For those who are running a small business, we recommend you invest in a swing-away machine in order to get the even pressure that you would be after. This is a truly top notch beginner machine with a cheap price tag! Read more about the DG Heat Press in our review post here. The 15 x 15" Clam shell Promo ﻿H﻿eat ﻿S﻿ublimation ﻿H﻿eat ﻿P﻿ress ﻿M﻿achine is another top seller due to its versatility in combination with a budget-friendly price tag. We love this machine for personal home use, as it offers all the advanced features you require, but with an easy-to-use interface. The P﻿romo ﻿H﻿eat ﻿P﻿ress ﻿M﻿achine has a full-range pressure adjustment knob which is perfect for those that wish to work with a range of thickness in material. One feature that makes this heat pressure is a stand out is the incredible heat range it offers. In comparison to the Power Press machine that offers temperature of up to 500ºF, this Promo Heat press can heat up to a whopping 750ºF. Which means it is the perfect machine for those wishing to work on thicker materials such as hoodies. 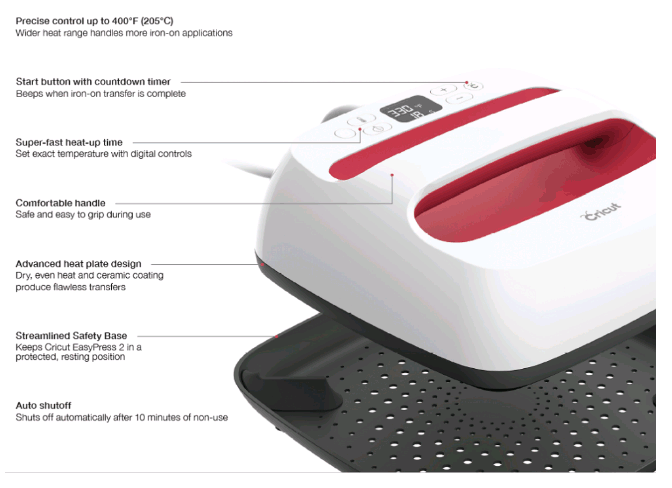 You can read our full review of the Promo Heat press here. The Promo vinyl heat press machine is a top notch machine if you are after a machine for personal use! We love all the advanced features and with the affordable price tag, this machine can be hard to resist. The trick is to find this machine in stock, as it tends to sell like hot-cakes. If you see it available, grab it. 3 Sizes Available: 6 × 7", 9 × 9", 12 × 10"
The Cricut Easy Press 2 is a very recently released heat press machine. This machine is perfect for craft enthusiasts. Ultimately this machine is a step up from an iron, but, not exactly at the same level as proper heat press machines just yet. They are great to get started making your own HTV projects. Cricut is a very highly respected brand, and they offer fabulous customer support. They are also always switched on with new updates and new product releases. 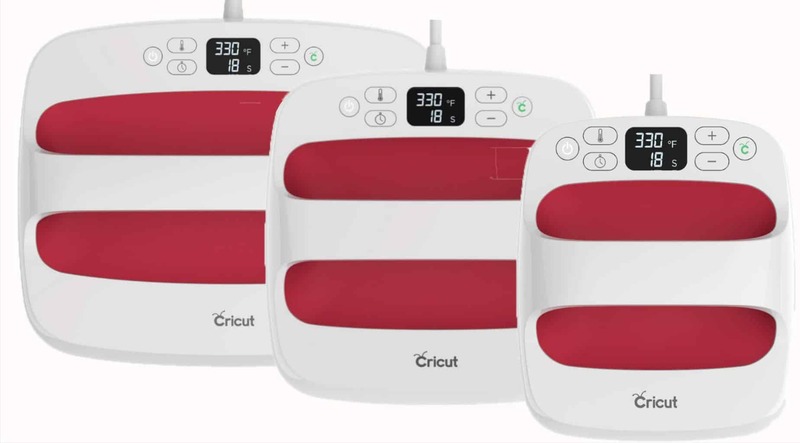 Cricut has managed to fill in a gap in the industry, for crafters who love to enjoy a bit of HTV crafts, but who don't want to invest in a large heat press machine. These heat press machines are great at applying consistent heat. There is a digital time and temperature display and a handy features that automatically shuts down the press after 10 minutes. The press comes with a heat resistant safety base. We love how easy the press is to set up and how easy it is to use. The Cricut EasyPress 2 is a brilliant buy for those who enjoy crafting at home and at crafting events. These presses are super lightweight and compact. They are cheap, they are easy to use and they are pretty classy. The digital time and temperature settings sets these babies well above everyday household irons. However you will need to use your muscles to apply pressure - which places them well below more professional heat press machines. We love our EasyPress and often pull it out when we can't be bothered with the larger heat press. Great for small HTV projects. Click on the button below to grab the machine only, or hop over to our guide on the best EasyPress 2 bundle deals. The Mophorn 5 in 1 ﻿H﻿eat ﻿P﻿ress ﻿M﻿achine is our top choice if you wish to create a wide variety of projects with your heat press. The machine comes with a 12 X 15" tee shirt press, a 6 x 3" hat heat press, a 3 x 3.5" mug heat press, as well as 2 plate presses. 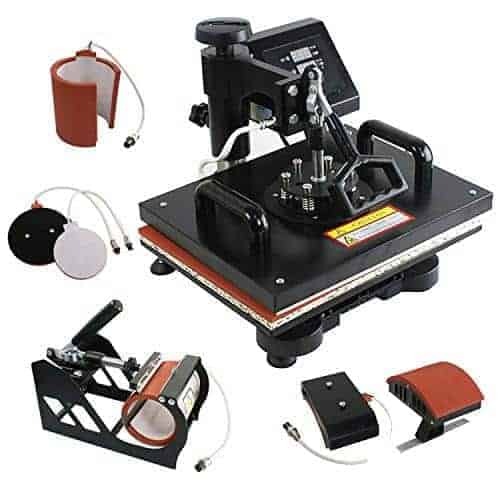 This favorite 1400-watt combo heat press machine can be used for projects such as T-shirts, caps, ceramic plates & tiles, mugs, coasters, mouse pads, jigsaw puzzles, lettering, vinyl and thicker fabrics and materials. We especially love its very affordable price-tag, which means that this machine is a small investment for any business. The top features that makes this machine a top seller is the adjustable multi-spring balancer which allows for even pressure across your platen; the 4/5" thick heating board which allows for heat to distributed quickly and evenly as well as the durability of the non-stick Teflon coated platen press element. The 360-degree swing heat press allows you to have a complete view of your layout, which means that you can work with projects that require precision placement. Whilst the intelligent temperature and time control system allows you to produce quality transfer items. The heavy-duty, commercial-grade build of the machine guarantees that your investment will pay off for many many years to come. 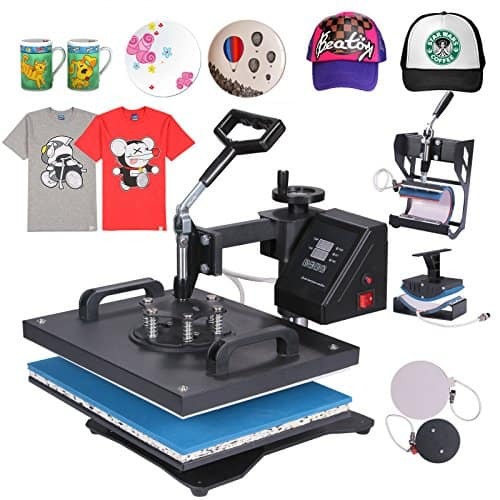 Perfect for personal or commercial use, the Mophorn 5 in 1 Multifunction Sublimation Heat Press outmatches its competition in terms of quality, performance and longevity. This machine is excellent value at a truly affordable price tag. It is the number one combo heat press on the market in 2019 and will keep on performing as the hot seller for a few years to come. Still not convinced? Here is our full review of this machine, or simply push the button below to purchase it on Amazon now. For a brand new edition to the heat press market, the ePhoto New 15" x 15" T Shirt Heat Press Machine is another great press for those into HTV projects. Ultimately this press is exactly the same as other clam shell heat presses. It doesn't offer anything new or different, but it is a great option - especially if one of the other brands are out of stock. The ePhoto machine has digital time and temperature display controls, which makes it easy for you to view the temperature and pressure at all times. It comes with a Teflon-coated heating element and has a top-mounted pressure knob so that you can adjust the pressure in accordance with the thickness of the item you are printing on. We love that this heat press comes fully assembled - hoorah! 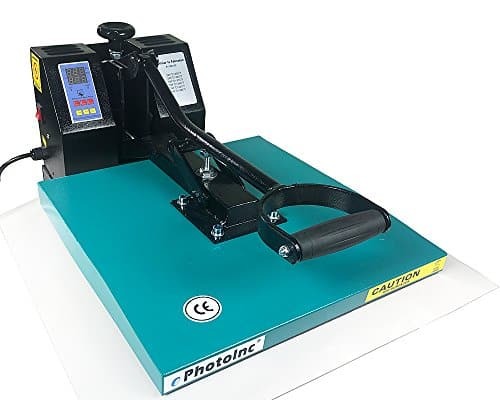 Personally I feel that the Fancierstudio Heat Press is a better buy, but for those of you who wish to test out something new to the market, the ePhoto Press will be the way to go. The Hotronix Heat Press is a complete and total game-changer! Sure it comes at a premium price, but it is also the world’s most advanced and brilliant heat press. 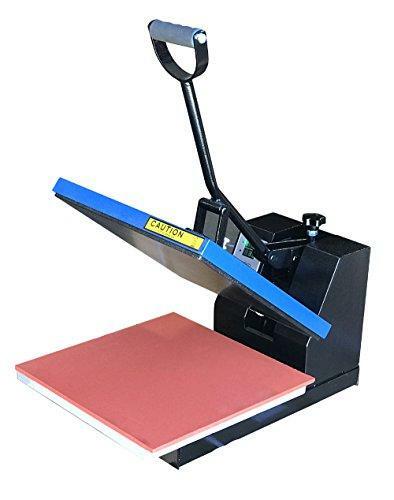 It has industry leading touchscreen technology and is the only heat press with a patented dual function of being able to operate as either a heat press swing away type or as a draw. This 16x20 heat press is the best commercial heat press machine on the market in 2019. It is a high quality vinyl heat press machine that comes with a massive 5 year warranty! This Hotronics heat press has brilliant features, such as thread-ability and an option to preset unlimited programs. This all means that you can complete your heat transfers faster, which equates to more money. The Hotronix Fusion 16x20 Heat Press​ is not only one of the fastest heat presses in the world, but it also one of the easiest to use. it displays the current temperature, time left as well as the pressure applied to the garment. 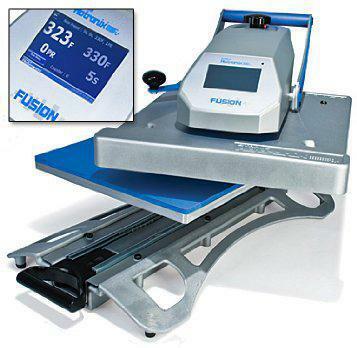 If you can afford the premium price, the Hotronix Fusion Press is a brilliant buy! It is the best heat press for vinyl and it offers outstanding features and top notch quality! This is the only machine you will need for your business. A machine that will allow you to create your heat transfers products quicker, easier and with more exact precise placing! We absolutely love this machine, we honestly feel like it stands out way above the rest of the heat press machines on out list! For more info, read our full and detailed review of the Hotronix Fusion Press. Auto-Clam | Large Heat Press Machine 16x20"
The Stahls Hotronix Heat Press is the top-of-the-line machine when it comes to durability and quality. It is a large 16x20 heat press machine which is perfect for those wishing to working on larger projects. The feature that makes this heat press so unique and that we personally love, is the nifty magnetic auto-open feature that prevents over-application - so clever! The Stahls Heat Press Machine takes the guess-work out of heat printing as it completely operates on a complete digitable level! It has digital time, temperature and pressure setting! We love how the Stahls machine operates with dedicated precision. The over-the-center pressure adjustment means that you will always get even pressure, whilst the innovative coils in the upper platen produce edge-to-edge heat. You can read our detailed review of the STAHLS Hotronix here is you wish to learn more about this press. The automatic heat press Stahls Hotronix is one of the world's most innovative machines. It is a best selling heat press machine for t shirts and a hot favorite machine for those who operate a business. Despite the premium price of the machine; the machine is a small investment as it is guaranteed to last you for many years to come! With a lifetime warranty on the heating element and a massive 5 year warranty on the framework, you know that this machine is high quality and built to last! Still not feeling convinced? Here is some more useful information that might help you decide. Heat press machines aren't cheap. They are bulky and they take up lots of room. So question is: Why not just use an iron?! Well, because it is so easy to hop on board the garment industry and create your own custom designs and t-shirt artwork from home (or from your business). You can now print your own images on fabric. And you can rest assured that these images won't feel, fade or wash away. You can't rely on an iron for your t-shirt printing business, you truly have to invest in a high-quality heat transfer press machine to ensure that you are selling quality prints. These machines allow you to offer versatility to your clients. They can pick whichever size, color or layers that they wish to print onto their t-shirts, caps, bags and more. People love choice and they love feeling in control, meanwhile you will reap all the profits of being able to mass-produce printed tees that will keep your clients returning for more. Whilst we have a whole guide about what to look for before buying a heat press machine, we will provide you with a quick summary below as to WHY you should invest in a heat transfer machine for your t-shirt printing business. Let's face it, the initial outlay cost of starting a t-shirt printing business is pretty minimal in comparison to most other business ideas. A professional t-shirt printing machine will only set you back by around $200 (for beginner machines). You can find more information on how much heat press machines cost here. After that you only need to purchase supplies (sheets/rolls of vinyl, quality tees, caps, bags etc), together with a few basic weeding tools. Heat press machines are pretty easy to use. If you can afford a high-end heat press, you will even find that a lot of the thinking is done digitally by the machine. Yes, you might ruin a few shirts and yes, you will need to learn some tricks of the trade, but ultimately it won't take you long to become an expert at t-shirt printing. Technology is incredible and we love how far the heat press machines have come over the years. These days even the cheapest heat press machines can produce high-quality long-lasting prints that will survive hundreds of washes. You will still need to learn the ins and outs of applying the correct temperature and pressure, however the high heat produced by the more expensive machines will definitely ensure that you print high-quality images that won't fade easily. We all know that time is money! The faster you can produce your products, the quicker you can sell them for profit. Which is why it is so important to invest those few extra dollars and invest in higher-end more professional heat press machines that are suitable for small businesses. You want to find one that is automatic, so that you can leave it to do its job whilst you deal with the customers. These machines allow you to use your time efficiently and to create products whilst you customer is waiting close by. Also look for a machines that feature a control panel that allows you to set programs for the application process, so that you can simply pick one of the pre-sets and let the machine do the work for you. A heat press machine might not be pretty and it might not be small, but let's face it - in comparison to other machinery used in businesses, a heat press is pretty small and truly occupies little space. Great for smaller floor space businesses. These machines can go above and beyond simply printing on cotton t-shirts. They can also print on cups, caps, canvas bags, canvas shoes, puzzles and more. You can print onto a variety of materials, from satin, cotton, ceramics, spandex & more. Thinking about going beyond simple front-or-back designs. What about trying out over-the-shoulder prints or wraparound image prints. Thinking beyond using a heat press for small business use and looking at the home users. Think about how much money you will save by being able to create your own customs tees. Not only will you save money but you will be able to show off some unique tees as well. It is important to check the vinyl packet instructions to see what temperature would work best with your type of vinyl. Typically you want to set a high temperature on the press which will help the vinyl to bond properly with your fabric. A low temperature will typically result in a design that is more likely to start peeling off after only a few washes. You can't just grab any t-shirt that is on sale and hope to use it for your vinyl transfers. You want a material that can handle the high temperature of the heat press, because the last thing we want is to melt the fabric, which will result in your having to clean the press. Look for the following types of fabric (you could also use a fabric that is a blend of the following): Polyester, Nylon, Cotton, Lycra, and Spandex are all fabulous choices. Your first job is to ensure that your t-shirt is aligned straight with the heat press. We also prefer to quickly give the shirt a 10 second press to ensure that all the wrinkles are out. It also helps to remove moisture as well. Next carefully align your graphic to ensure that it will print straight as well. You might even want to measure this out to ensure that the design is in the middle of your shirt and that the edges are straight. If for any reason you make a mistake, don't worry as you can remove the vinyl and try again. Making use of the best heat transfer vinyl that suits both your type of fabric, as well as the color of your garment is really important. It is also important to check out the current reviews on the vinyl to get a quick idea of the quality. It is also a great idea to choose a vinyl that is easy to apply and easy to weed. If you are going to go to all the trouble to create a quality printed tee, you might just as well go to the effort of looking after it properly. Turn your shirt inside out before washing. This will help to prevent friction which will wear down the transfer quicker. Don't use any strong detergents as it might loosen the adhesive of the transfer design. It is also best to let the shirt try naturally. If you do have to tumble dry, ensure that the heat setting is set to 'cool'. Make sure to iron the shirt inside out as well, so that no high temperature is applied directly to the shirt, as this could cause the adhesive to melt. So hopefully you will have another look at our heat press machine reviews in our heat press buying guide above and see if you can find a suitable machine for your needs and for your budget. Now that you have found a new heat press machine for your office or business, why not hop over to our craft blog section. We have loads of tutorials, project examples as well as step-by-step posts to help you. Save this post for easy reference by pinning it to a board on Pinterest! The best brand of heat press machine are Stahls, Geo Knight, Hix and Maxx. They are all manufactured in the USA and offer the most reliable, robust built that should last you for long term rigorous use. Heat transfer a process where you heat press printed images or text from special transfer paper in order to transfer it onto a product such as a shirt. Did our list of top heat press machines help you find the right heat press for you?